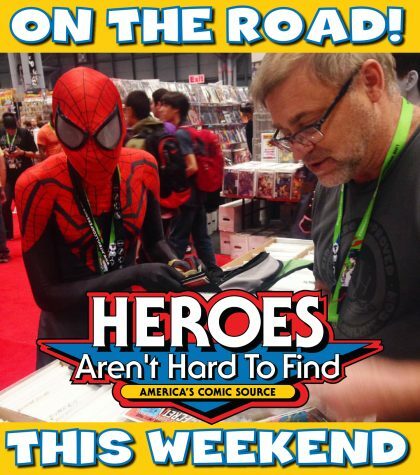 The HEROES staff will be hitting the road for TWO separate conventions THIS WEEKEND! You can catch Shelton and Winslow selling funny books this Saturday, August 25 from 10am-5pm at the Virginia Vintage Comics and Collectibles Show (Salem Civic Center – 1001 Roanoke Blvd, Salem, Virginia 24153). Admission is $3 for Adults and Kids 12 and Under get in FREE! You can catch them AGAIN on Sunday, August 26, from 10am-4pm at the Raleigh Comic Book Show (Hilton Garden Inn Crabtree Valley – 3912 Arrow Dr, Raleigh, North Carolina 27612)! Admission is FREE! If you have a special request for a comic book, or if you would like to place a supply order to pick up at the show, please let us know in advance! Email Seth@heroesonline.com or Shelton@Heroesonline.com by Friday morning, August 24, and we will do our best to accommodate your requests! ← LABOR DAY WAREHOUSE SALE!! HEROES CELEBRATES ONE YEAR #UNDERtheWATERTOWER!